PAGAN ALTAR is a Doom Band formed way back in 1978. As part of the NWOBHM, they only had a chance to release a small amount of music during the scene’s heyday. However, they reformed in 2004 and re-record their second album, “Lords of Hypocrisy,” featuring previously unreleased material which had been written during their original tenure. This release has now been digitally remastered, thanks to TEMPLE OF MYSTERY RECORDS. I haven’t heard the original master but this one sounds really good—-clear but with enough old school grit to keep a stark edge upon it. I love Doom Metal and this band escaped my attention, I never heard of them before their promos came to my attention. Without a doubt, this album is a hidden gem among Doom, Old School Metal, and just music in general. 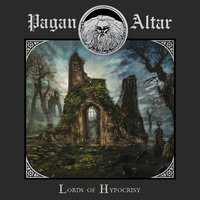 A lot has been said about BLACK SABBATH, PENTAGRAM, and WITCHFINDER GENERAL but PAGAN ALTAR deserves to be mentioned beside those names as well. The title track kicks the album off with some ambient textures mixed with high pitched clean vocals; frontman Terry Jones sadly passed away from cancer in 2015 but he had a lot of power behind his voice; it was a very unique voice that had a certain magic to it…a playful energy with infectious quality. Alan Jones’ first riff in the song is a classic example of Old School/Traditional/Doom: heavy and obscure but still filled with groove and head banging exuberance. “Sentinels of Hate,” has a folk tale quality to it—Terry’s vocals are more spoken word here than actual singing but it works with Alan’s clean guitar approach and Protch’s standout bass. About halfway through the song, the band settles into a groove backed by Elliot’s drums that back up everything the song has to offer while being rewarding enough on their own. The almost eleven minute long “Armageddon,” is the definition of epic, a track that throws everything it can into it but never comes off boring or prodding. Each note, each piece has a place needed. The best part of the song is around the halfway mark with the sporadic guitar lead, little notes that build upon each other. The last minute of the song, consisting of a jamming section with each member giving it their all, is a strong finish to an already empowered track. However, it feels like this one should had been put at the end of the album. The album’s flow is a slight problem; “The Interlude,” is a meandering track compared to the others although it isn’t a bad song. “The Devil Came Down To Brockley,” is a decent little romp but it sounds very out of place on such a heavy and macabre Doom record. It also sandwiched between two excellent tracks, “The Masquerade,” and “March of the Dead,” so it kind of becomes lost in the shuffle. The latter ends the album strong, due in large part to its creepy and harrowing atmosphere. The former is rather diverse track, divided in half by a quiet, cleaner approach and one that is definitely a nice slab of Metal. I’m kicking myself for not knowing about this band until now but better late than never. This is a classic Doom album and this reissue is a great way to remember Terry. Any fans of old school Metal/Doom need to add this to their collection.